Posted February 9, 2017 by HPGhotrodLogin & filed under Uncategorized. Yeah, that kid was me and this is the story of those plastic cars that everyone bought at their local five and dime. They are the heroes of the “Backyard Baja” and the “Bedspread 500”…the Korris Kar. Here’s how they came to be. Ed Koren and Charlie Youdris were two friends in the plastic molding business. They had been thriving ever since 1946 when they took over an old bakery storefront in Cicero, Illinois. Armed with only two presses, they began molding shoe and pastry display stands. They decided to call the business Korris Products. (Take the first three letters of Ed’s last name and the last three letters of Charlie’s last name and you have it.) Things were going pretty good. They received the contract to produce plastic wings for Studebaker hood ornaments. Ed’s neighbor Leo Albiani, soon came onboard advising them on mold and pattern making techniques. When the bakery building could no longer hold them they moved to Lyons, a suburb of Chicago, where their twelve presses turned out parts for Zenith and O’Cedar as well as other clients. Leo’s brainstorm, the patented blue triangle lids for the Morton salt containers made them a major player in the business! About that same time, Ray Pierson, a toy wholesaler and innovator in his own right, was looking for another toy to market. Ray was a man of modest beginnings and his is a classic American story. He was a young man from Argentina who left the family farm to pursue his future in the big city. He found himself working at the toy department of Woolworths, a job that would shape his destiny. Before long he was marketing toys that he had specially manufactured. Ray became involved with producing lead soldiers until the need for lead during WWII put and end to his supply. He switched gears and began producing wooden toys. In the fifties, he began noticing more and more toys made of plastic. The production capacity was greater and the cost per part was cheaper. Ray decided he wanted to make plastic toy cars. There were other companies manufacturing plastic toy cars at the time like Processed Plastic, Renwal, Irwin and many others, and they were having a great deal of success at it. Ray’s toy cars had to be different in order to sell. In about 1958 a toy Plymouth station wagon in the popular 1/25 scale hit the market. It had an opening tailgate and a clear plastic windshield. Ray must have looked it over really well. The cars he wanted to make were just a step above that Plymouth wagon. In 1959 he walked in the offices of Ed and Charlie at Korris Products. His pitch must have been good because despite how busy Korris Products was they agreed to make Ray’s toy cars. They were called Korris Kars even though Ray owned the molds. Here was Ray’s improvement over other toy cars. They had separate grilles and bumpers molded in silver, and clear windshields that were held in place via the vent windows just like the Plymouth wagon, plus a separate steering wheel. The cars were 1/25 scale and designed to be snapped together and be disassembled easily by kids. This was an improvement over the Plymouth wagon, which was riveted together. The product line was made in unbreakable polyethylene and began with tooling up the 1959 Fords, a coupe and convertible, a wagon and a Ranchero. All patterns were directly taken from the available promotional models or kits from AMT and PMC. Later they added a 1960 Chevy convertible, a 1961 Cadillac, two ’61 Thunderbirds, a 1963 Corvette and the popular Jaguar XKE fastback and convertible. Korris didn’t miss out on the ’65 Mustang craze either. All three body styles were produced. Non-yearly cars included a 1932 Ford hot rod roadster, a slingshot dragster, a Ford GT 40, a Lotus race car and a 1956 T-Bird. 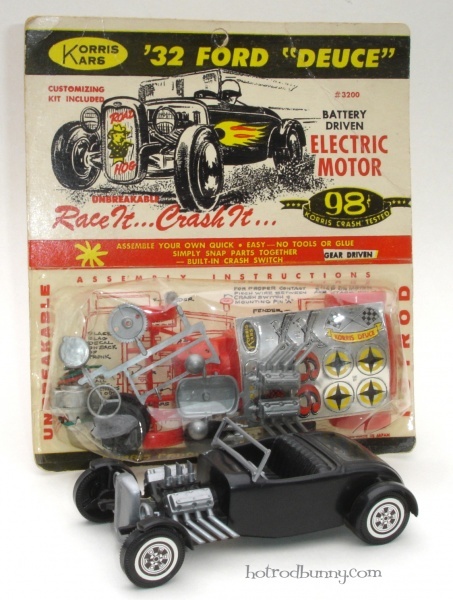 The product line grew and they dabbled in 1/32-scale battery operated slot cars and several large-scale cars as well. But the best sellers were the 1/25-scale cars which eventually received chrome plated bumpers and notorious foil sticker hubcaps. The sheet of foil detail parts was supplied by an outside printer but all packaging was done in-house. 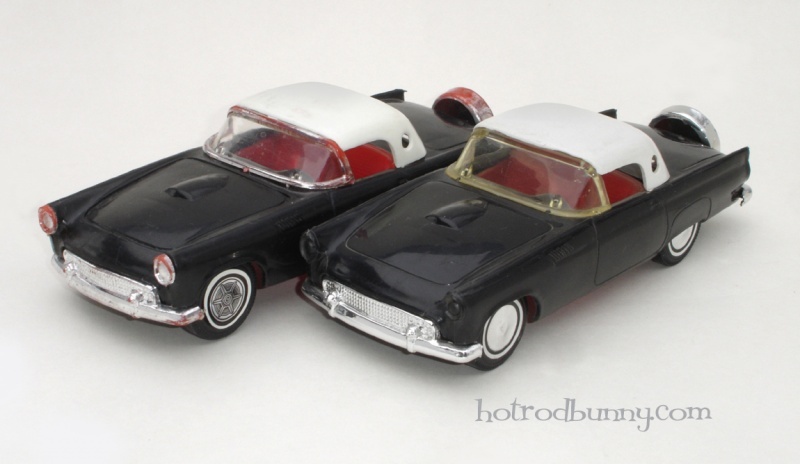 The cars were offered two ways, as a pre-assembled car in master cartons and as a model kit! The latter was first offered on a blister card. Then the 1967 Camaro and 1968 Corvette came in a box to look more like a standard assembly kit. At one point, Korris Products had over 24 employees on an assembly line putting these cars together. Demand was high for these quality toys. As more inexpensive toys from Hong Kong started flooding the market, Korris found sales becoming sluggish. In 1970 Ray Pierson retired and Ed and Charlie bought him out. It was a short-lived run and in 1973 the molds were sold to another manufacturer. The large scale Korris Kars Mako Shark was later released under the Simms name. I have never seen the other cars re-issued. Perhaps Simms only bought the Mako Shark molds. Sadly, it was the end of an era. 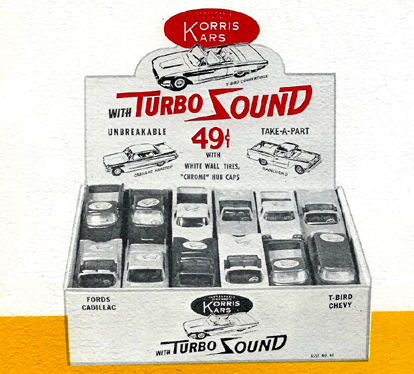 But, those of us who were kids in the 60’s will look back fondly on those well detailed Korris Kars. So, what happened to my little white ’60 Chevy convertible? By 1967 it found new life as a slot car. It was truly unbreakable although the windshield frame had sheared off. I had it screwed to a “Classic” slot car chassis with it’s back-end high in the air. I regularly sailed it off the track at the local Vanguard raceway in Chino California. Just across the parking lot from TG&Y! Note the very first ’59 Fords made by Korris Kars had rubber tires. The ’59 Ford Ranchero and station wagons were offered in both civilian and military garb. The popular ’60 Chevy convertible. Note the foil hubcaps and seat inserts. 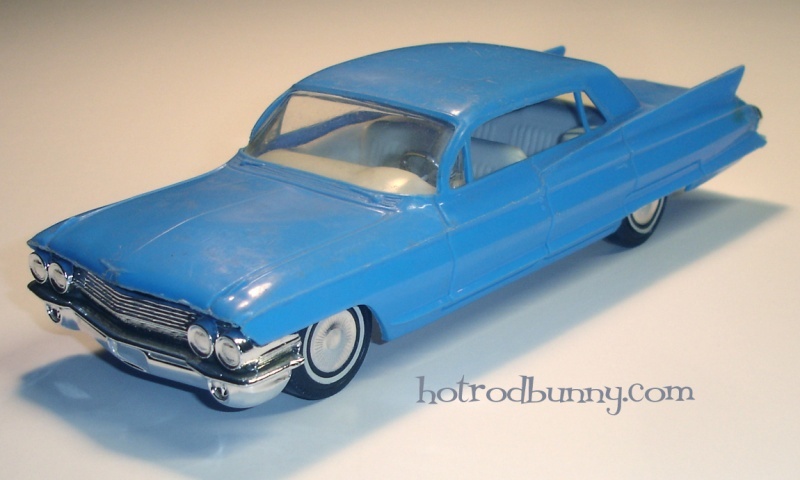 The elusive ’61 Cadillac Fleetwood sedan. A copy of the JoHan kit. Yeah, I finally got one! The ’61 Thunderbird came in both coupe and convertible models. The Corvette Stingray originally issued as a ’63. The molds were later changed to remove the split window and update details. The ’63 hood remained on all models, however. The ’65 Mustang was well represented with all three body styles available to awaiting kids. Jaguar XKE fastback and roadster. Many of these cars were offered with battery operated motors. These were some of the last cars tooled up by Korris. 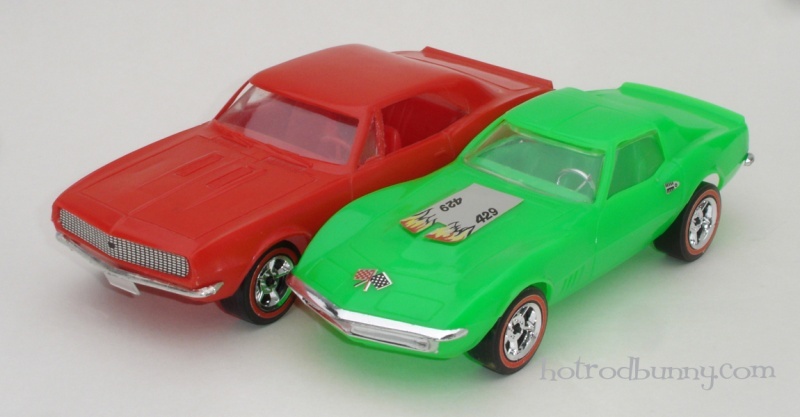 The ’67 Camaro and ’68 Corvette. 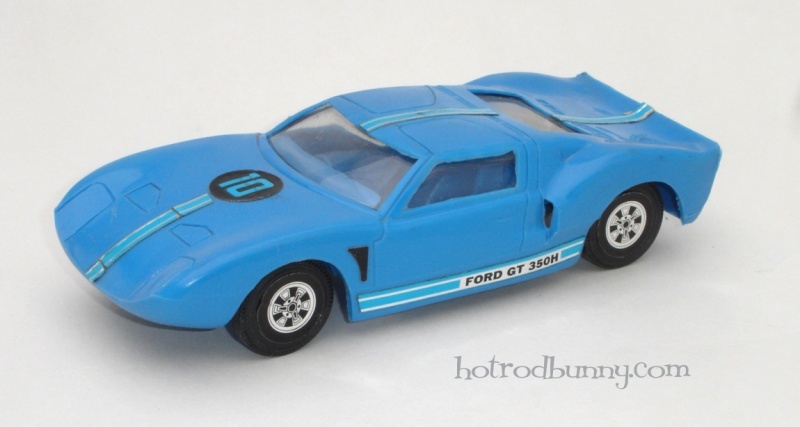 The Korris Ford GT 40 competed with the Gay Toys version, which is easier to find. The ’56 T-Bird was offered in two different versions. One with separate headlight bezels and windshield trim. The Deuce roadster hot rod was an early offering by Korris Kars. They cashed in on the popular craze in the early 60’s. This unopened kit was purchased from an employee of Korris Products years ago. One of the master cartons available to retailers in the mid 60’s. This logo promised big play value at a small price. Hello – I’m bidding on a 67 camaro with electric motor – it has skinny tires with white walls & impala ss type hubcaps – are these original?? Doesn’t sound like it. The car came with red lines only I believe. 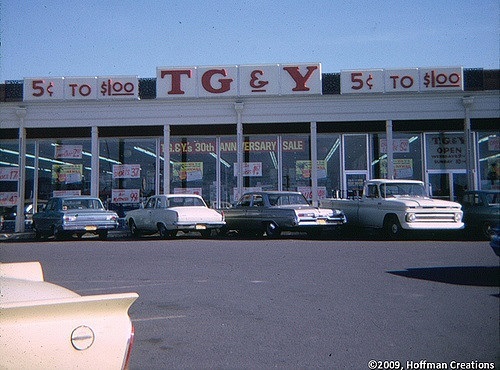 I try to buy all the different 59 fords and colors. I have 8 of them. I had been doing colors a while back. I decided to just keep the cars I liked best. One each. I’m not sure what all colors they came in. I know they came in white, red, blue, light aqua green, and army green for the military issues. Can you think of any others? I have aqua, but dont have anything in blue. Im looking for one in the package if it exists. The ’59 was the first made and the car best represented by Korris. All the photos of the cars in the article are from my collection. I sold off many a few years back. I decided to just keep the best of each body style. I have never found another early convertible like the one pictured. It is one of my favorites. I haven’t seen a package for them. I’m sure there may have been one if it was offered as an assembly kit. Most were just sold in their own carton or placed in a bin at the store. I just bought a red 59 ford convertible on ebay. Ive really enjoyed this article. Its good to see that other people are interested in these cars like me. Thank you, like I said in the article, I have liked these cars since I was a little kid. I’m glad I’m finding other Korris Kar fans out there. Do you have an extra white 59 convertible for sale or know where I can get one? 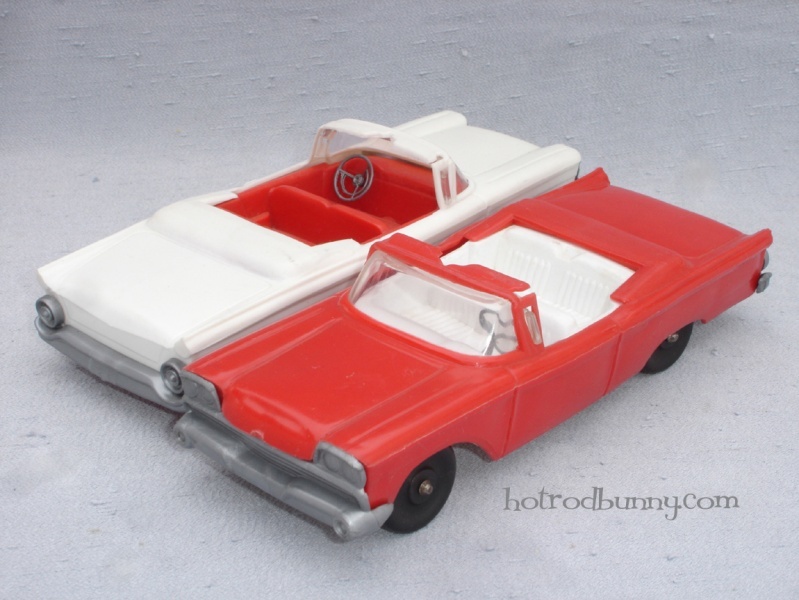 I’m up to 13 colors of the 1959 ford but I still need the white convertible. Hey Jerry, Glad to see you’re getting so many variations. I didn’t realize there were that many colors. As you can see from the photos on the blog I used to have a white convertible. It was sold on Ebay years ago. I’d love to see a photo of the colors. Send me your email address and or phone number via puttputt1982@yahoo.com and I’ll send you a picture. Found a 59 ford ranchero with red with red interior, also a 59 wagon white with white interior. Up to 15 different 59s. It amazing that there are so many variations. Do.you have any extra bumpers for the 59 fords? It would be nice if you included a camera icon so people could post pictures. Up to 18 different 59 fords. Still looking for the white convertible though. I live in Lyons, and the factory building still exists. I remember having these as a kid, the last being the Camaro, but the Caddie always had a soft spot in my heart. I just won an auction for a Korris Go Kart coming across the pond from jolly old. Got a split window Vette in mint shape including a working motor out of MX. These things are everywhere!